The Church Arise! LivingWater Ministries (CALM) is a non-denominational non-profit Christian organization whose vision is to be of service to the Body of Christ in these end times. Simply put, the vision of the Ministry is to arouse the Body of Christ to the challenges and opportunities of these end times. We seek to encourage children of God not to give up to the wiles of the devil, who as the Scriptures say, is on the rampage these days, knowing that he has but a short time (Rev 12). At Church Arise! LivingWater Ministries, we believe that the coming of the Lord Jesus Christ is imminent. We believe however, as the Lord has affirmed in the Scriptures, that no man will be given any dates for this event - and so we must remain ready at all times. 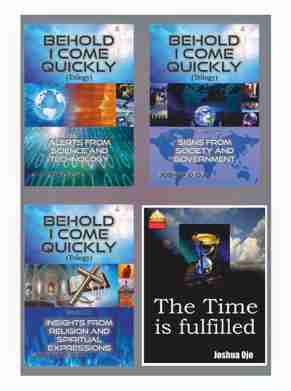 We further believe that as a build-up to the coming of the Lord, the world is currently irreversibly headed for a one-world government, and a one-world religion. This is the essence of Secular Humanism. Church Arise! LivingWater Ministries (CALM), P.O. Box 1674, Ile-Ife, Osun State, Nigeria.